23 categories match your search criteria. What are we supposed to do after ? What graph would be best to use when dealing with changes over time? What graph is best to use when dealing with different parts of a whole? 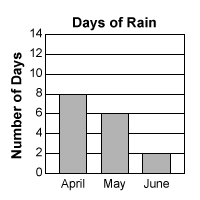 Which graph would best be used when you are dealing with whole numbers? In a lab, both the independent variables and dependent variables are numerical data. What type of graph should you use to plot the data? A graph made up of connected lines or curves. 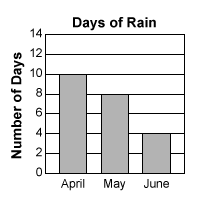 A graph made up of unconnected points. Which graph is best for displaying data that changes over time? Which type of graph would you use to show the proportion of students who own a cat, dog, fish, bird, and no pet? What type of graph shows change over time? Which is the best graph to use to compare the prices of six different cars? Every day at school, Clare and Natalie record the amount of water left in a bowl until all of the water has evaporated. When they are finished, they want to clearly represent their data about water and evaporation time to the class. Which of these would best represent their data? 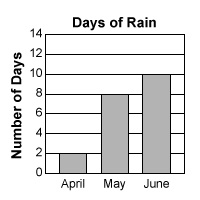 Which bar graph shows the data below? 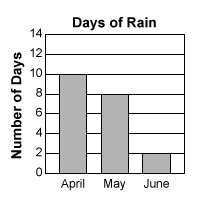 Which bar graph correctly displays the data in the table below?